So, How Are Things At High Rock? I can’t tell you how often I get asked this question…mostly from people I’ve served with in previous churches or old friends, but many times from fellow church leaders. Now while I know it’s a well intended question, most of the time, what they are really asking is actually something totally different. What they really want to know is “how many are ya runnin’ on Sundays?” And usually that’s how I respond, spiced with a little current event action mixed in. I tell them what attendance is like, and what we’ve been involved in over the last few months, and how many people have shown up to our new campuses. Our mission is simple…it’s for people to experience LIFE CHANGE through Jesus. Our goal is to create environments where ANYONE and EVERYONE can get a second chance at experiencing that life change, no matter their baggage or past. So when people ask how things are going…why don’t I just tell them. Why don’t I just brag on the work that God is graciously allowing me to be a part of. So I did…and you know what…they were blown away. They couldn’t quit talking about how amazing it must be to get to play a part in a movement that changes lives like that. And they were right. So since I shared it with them, and they got excited, I thought I’d share it with you, and maybe you will too…. QUESTION: How’s things going at High Rock? ANSWER: AMAZING…HUMBLING…LIFE-CHANGING. 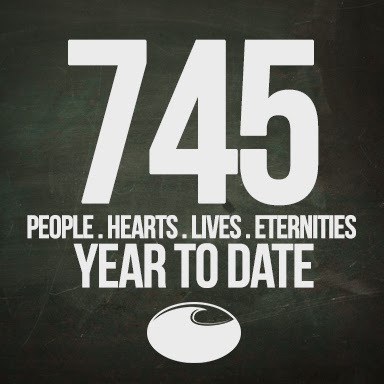 This year alone, ALONE, we’ve seen 525 adults make the decision to surrender all and become a Christ follower. In that same time we’ve seen 220 teenagers make that same decision, and flood their schools with the presence of the Gospel. Did you catch that? We’ve seen 745 people move from skeptic to saint, or from fan to follower. SEVEN HUNDRED AND FORTY FIVE. That’s how we’re doing! And the best part is, we can’t and won’t take an ounce of the credit. Every time we’ve heard God speak, we’ve simply stepped, and as a result HE has changed the HEARTS, LIVES, CURRENT REALITIES, AND ETERNAL DESTINATIONS of 745 people all across our region. This doesn’t even include the nearly 600 kids who are hearing that God loves them and has a plan for their life each and every week, many of whom have made the decision to follow him as well. What else matters? What else should we talk about when people ask? Apparently God is all about the number of changed lives. So I want to be, too. And so should you. 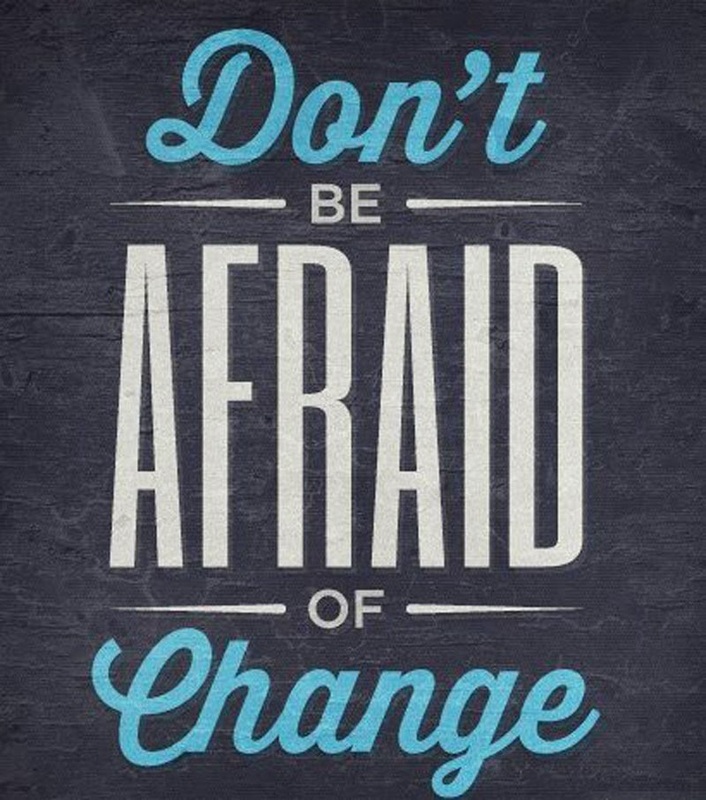 Ever feel uncertain of the future because of CHANGES in your life today? Sure you do. When things change, we step into the unknown, and there’s always an inherent fear that comes with stepping into the unknown. It’s just the nature of change. Often, when you have a comfortable routine in your life that you are used to, you can stroll through each day forgetting all about the God who has blessed you with the very life that you have. It gets easy to become self reliant, because YOU are the expert on the system. But when you get the rug pulled out from underneath you, and systems and routines in your life change, you are no longer the expert. In those moments, we find ourselves crying out to God asking for direction, and guidance, and comfort, and peace…right? We find ourselves doing the very things we should have been doing ALL along, but had no real need to. Change forces us into a posture of reliance and dependence on the only one who actually has control of our situation. It causes us to lean in relationally to the one who had been leaning into us all along. So while change may be difficult, and full of the unknown, it also creates an atmosphere for us to walk under the direction of God’s Spirit. Don’t let change pass you by, without it drawing you closer to the one you should have been that close too all along. Don’t miss the opportunity that He is giving you to live the way you were always meant to live, in a real awareness of His presence. And may it be a constant reminder when new routines form again. Sounds crazy doesn’t it? I mean, why would anybody ever want to do that? If following Jesus means I have to put myself on a proverbial instrument of death…DAILY…why would following Jesus ever be appealing to anyone? Now, before you answer, think about what the verse is asking…Jesus wants us to get up everyday and crucify what WE want for the sake of what GOD wants… why would I EVER want to follow someone who asks me to give up MY hopes, MY dreams, MY desires. The simple answer is, for most of us, we wouldn’t…and here’s why: If we we’re all honest…there’s one thing we as humans LOVE…and that’s freedom. We LOVE the ability to wake up every day and do what WE want. -When you’re a kid, you can’t wait to grow up, and move out. Why? So you can do what you want. –When you finally do move out, one of the biggest fears we have about getting married, is giving up our freedom to do what we want. -Once we finally do get married, we love guys poker night, or girls night out…WHY? So we can do what we WANT. From the time we’re little, we love doing our own thing and getting our own way…and when we don’t, we hate it…don’t we? So why in the world would ANYBODY ever want to be a follower of Christ…who asks those who pursue living in His footsteps, to GIVE UP what they want, to crucify what they want on a daily basis, for the sake of doing what HE wants. 1 Corinthians 1:18(NLTse) – 18 The message of the cross is FOOLISH to those who are headed for destruction! But we who are being saved know it is the very power of God. Wait, what? It the POWER of God…in our lives? I thought following Jesus meant giving up power? Well, it does…but it doesn’t mean losing it…it just means changing the source. Let me explain. The problem for many of us, is that we don’t understand what the POWER of the cross does in our lives. We don’t understand what’s being gained when we Take. Up. Our. Cross. See before Christ DIED for you on a CROSS, and gave you the ability to take up your cross daily, the only thing you had the capacity to take up daily…was control. And for most of us, we like it that way…we like having control. The problem is, when you try to control everything that happens in your life, you also assume the BURDEN of making sure everything goes right. When you’re the one in charge, it ALL falls on your shoulders. Don’t get me wrong, authority is fun…for a while…but when you carry the weight of responsibility that comes with that authority long enough…it begins weighs heavy on you. It always does. The GOSPEL, the good news of Jesus says this: “follow me…and instead of waking up every day and taking up your burdens…I want you to take up your…cross.” That means crucifying your desire to be in control, crucifying your desire to do things your own way and letting The God of the universe take control in your life every single day. And in taking control, He also takes the burden from you of doing life on your own, and helps that burden. You were never meant to live life alone, you were meant to live in relationship with God allowing HIM to bear your burdens, but he can’t do that as long as you want to assume and maintain CONTROL. Now, is that difficult? Sure it is. Is it hard? Sure it is. Does it hurt? Sure it does…ITS A CROSS! Just as it did with Jesus…the CROSS hurts for a season, but ultimately, it always results in FREEDOM, and peace. That’s why Jesus says my yolk is easy and my burden is light. Wait a minute easy? Light? 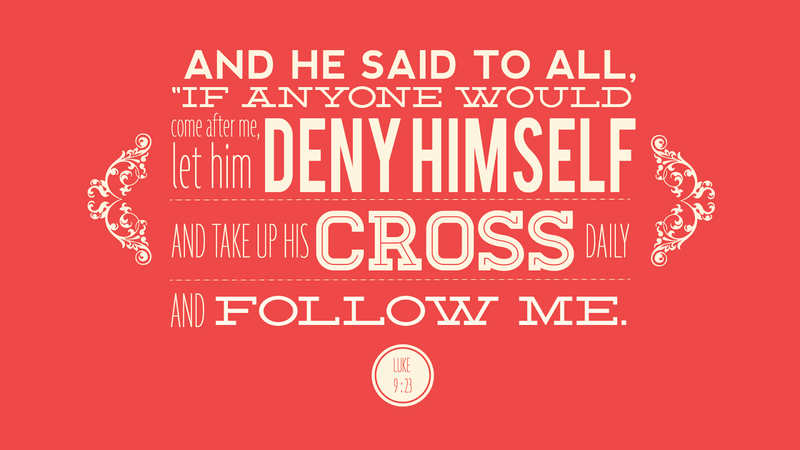 I thought you said following Jesus was about self sacrifice, and dying to yourself, and taking up your cross. IT IS! But that’s just it, the freedom found in the cross makes your life easier to bear than living in the false freedom of YOU being in control. You see what God does with the cross in your life? It’s the same thing He did with the cross Jesus died on. He takes something that kills…and turns it into something that saves. When you take up YOUR cross, while it does mean dying to what you want, you’re exchanging it for what God wants, which is a far more FREEING way to live. So, yes, taking up your cross does sound foolish. But it’s the only conduit to find true freedom…which is what we’re ALL looking for anyways. I who live, but Christ lives in me. So I live in this earthly body by trusting in the Son of God, who loved me and gave himself for me.